What must you do after filling your fuel tanks? What must you do after filling your fuel tanks? Road transport accounts for 20% of all emissions, so we can reduce pollution in town centres by walking or cycling when possible (instead of making short journeys), but that’s not always convenient, especially when you need to deliver large loads or the weather is particularly bad. Vehicles damage the environment by using natural resources, increasing air pollution and building deterioration, but there are ways of reducing the damage. 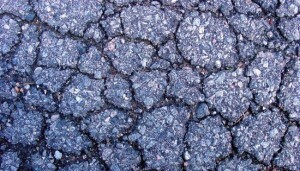 Lorries and buses cause disproportionate wear on road surfaces creating tarmac cracking and potholes. In this article we’ll look at how drivers of heavy vehicles and passenger carrying vehicles can reduce their environmental impact. It contains all the knowledge you need for your theory test. 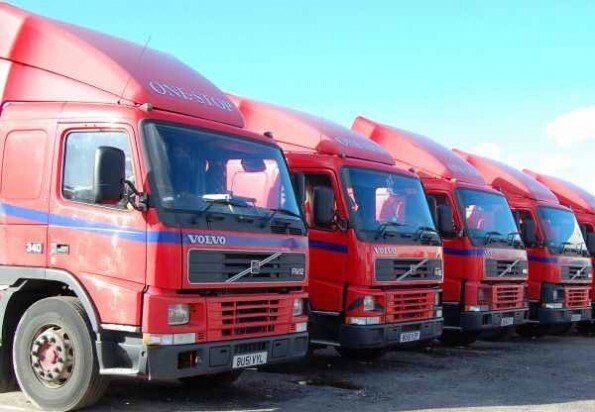 A benefit of the Driver Certificate of Professional Competence (CPC) qualification is expected to be enhanced professionalism and reduced fuel consumption and emissions resulting from a better knowledge of ecosafe driving techniques. A driver’s skills are improved and poor driving habits are reduced. Anticipation of hazards ahead, and reading the road conditions and direction, can lead to more environmentally friendly driving as you will be in the right gear at the right speed and will eliminate unnecessary braking and acceleration. Your engine will have an optimal speed for best fuel usage. You will be able to get information about this from the vehicle manufacturer. Most cars are built so that they have optimal fuel consumption at around 50mph. Trucks and buses will be different, depending on their commercial application. Sometimes, reducing your speed by a few miles per hour can make quite a lot of difference because wind resistance increases exponentially with speed. Driving with your engine in the red band for long periods will cause the engine to wear prematurely and will lead to expensive repairs which could result in the vehicle being off the road for some time. A vehicle that’s off the road can’t make you money. Try to keep the rev counter in the green band. Continuous use of air conditioning will reduce your fuel economy. However, driving with the window open also has the same effect because it reduces the aerodynamic efficiency of the cab. Rather than use air conditioning, can you take a layer of clothing off? Air conditioning can use around 15% more fuel than not using it. Block gear changes can also save on fuel. This is where you miss some gears rather than accelerating up through every gear. If your vehicle is fitted with an engine management system pressing the accelerator when you start the engine will waste fuel. Speed limiters can help reduce your fuel usage as you will use more fuel if you exceed the speed limit. You should be aware of their effect, though, when you are overtaking. Avoid overtaking another vehicle that is also accelerating as it might start to exceed the speed that your vehicle is capable of. If it’s fitted with a speed limiter it must also be fitted with a plate in the cab. Driving at 70mph uses around 30% more fuel than driving at 50mph. Drivers can improve their fuel economy by regularly changing filters and ensuring their vehicle is serviced regularly. Poorly maintained engines use more fuel and emit more exhaust fumes than those that are well-maintained. A well-maintained engine could also be quieter, resulting in less noise pollution. Members of the public are encouraged to report vehicles emitting excessive exhaust fumes. Drivers can improve fuel economy by planning journeys outside of busy times, or using technology that warns of traffic jams and reroutes the planned journey. It also makes for a more pleasant journey if you are not held up. Looking at a map before setting off will give you a better idea of alternative routes should your desired route be blocked. Of course, satellite navigation systems, whether standalone or phone based, will also be able to automatically reroute your journey if you turn off. Some systems will warn you of traffic or incidents ahead. Find out more about navigation using different methods here. Using bypasses rather than town centres will help improve economy and reduce pollution. If you have to park for any period of time, for example to look at a map, collect a load or pick up passengers, switch off your engine to conserve fuel. The same applies if you are stuck in a queue of traffic that doesn’t appear to be moving. You can turn off your engine to reduce noise and vibration, too. Route planning should also be used to make you aware if there are any cancellations you might be relying on, such as a ferry cancellation because of high seas, or a bridge that is closed to high-sided vehicles because of the wind. There are plenty of options online including Google Maps, RAC and AA. Use a cab-mounted wind deflector or air deflector to improve the aerodynamics of your cab and reduce the wind resistance; they will be especially effective in a headwind. Along with lower side panel skirts which channel air along the side of the vehicle rather than allowing it to hit the rear wheels, they will improve fuel economy. Keeping the height of your load to a minimum also reduces drag. 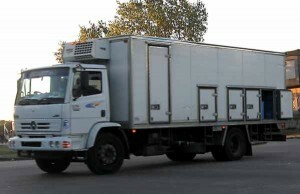 A box truck such as the one shown on the left doesn’t have a wind deflector on the top of the cab, or side skirts. This means that wind doesn’t flow smoothly over the truck, and this increases wind resistance. Air flowing around the front tyres then hits the rear tyres, creating drag. Modern trucks are being designed in more aerodynamic ways with improved frontal profiles, wing mirrors and aerodynamic skirts. The trucks shown below have wind deflectors above the cab. Energy-saving tyres can be used. They have a reduced rolling resistance as well as better grip, which reduces the amount of fuel you use. Whichever type of tyres you use, checking the pressures are correct can reduce fuel usage. Under-inflated tyres have increased rolling resistance, so pumping them up to the recommended level reduces rolling resistance. However, over-inflating them increases wear and also the chance of getting a puncture. The PDF linked from this page has more information about tyres that help with fuel efficiency. If you are pulling a trailer or driving a lorry with a tipper body, a fly sheet can be attached tightly over the body to reduce drag and make it more aerodynamic. When carrying loads a fly sheet will make it more aerodynamic and will prevent loads from being blown from the trailer. It is a legal requirement to ensure that your filler caps are securely fastened before driving off. This is because spilled fuel is a hazard to the environment and also to other road users (especially motorcyclists) as it is slippery. You must also clean up any fuel you have spilled. If you lose your filler cap you must replace it immediately; using a rag will not prevent against spillage. You must not use red diesel unless you are authorised. Red diesel is subject to less excise duty than standard diesel, so it is considerably cheaper. It should only be used for authorised purposes. Any driver whose vehicle is found to be using this fuel illegally faces severe penalties. Red diesel has a red dye added so that it can be identified. Red diesel is used for applications such as home heating oil. If you are at a roadside check and staff from HM Revenue and Customs are there they will be looking for red diesel, as well as the type and legality of any load being carried. Reducing emissions can be achieved by choosing a low sulphur diesel. A driver that carries hazardous goods must be certified. This certification must be renewed every 5 years. The driver will have vocational training in fire-fighting, plus the environmental hazards that different types of goods can cause. You must not use your reverse warning bleeper between 11.30pm and 7am in 30mph areas. Try to avoid making unnecessary noise when driving and manoeuvring. You must not use your horn in a built-up area between 11.30pm and 7am unless another vehicle poses a danger. If your vehicle requires air pressure, the most environmentally friendly way of allowing it to build up is with the engine running at idle. Air suspension can reduce the impact on the road surface, underground services and bridges by reducing the pressure of the weight of the vehicle driving on an uneven surface. 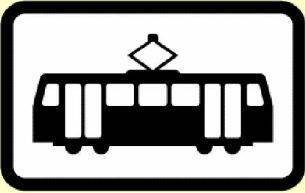 One double-deck bus can carry the occupants of 20 cars. As it only has one engine, it reduces pollution. Also, because it removes 20 cars from the road, other drivers don’t experience as much congestion and this reduces pollution, too. Electric trams reduce noise, emissions and fuel consumption, plus reduce the number of vehicles on the road, therefore improve traffic congestion in towns. If you have been stopped at a roadside check, staff from environmental health departments will be there to test your vehicle’s emissions. Driving and parking on verges can cause damage to the verge. You must not park and leave unattended any vehicle over 7.5 tonnes on a verge without police permission. You can park on a verge for essential loading, but only if a person remains with the vehicle who can move it. Some forms of transport are more environmentally friendly than simply driving. Supertrams or Light Rapid Transit (LRT) systems are environmentally friendly because they are electric-powered. This means that they do not emit toxic fumes, which add to city pollution problems. They are also a lot quieter and smoother to ride on. You can car share or car pool to help cut down on pollution, and wear and tear on your own vehicle. If possible, bike or walk if the journey will only be a short one. Often it’s quicker (and certainly cheaper) to walk distances of 10-15 minutes rather than driving and trying to find a car park.